My father has given concert tickets for my birthday ever since I began developing my taste beyond the convenience of pop radio. At 13, I saw Leonard Cohen. Twenty-seven was for Bob Dylan. And This year, for my 28th, I got to see Paul Simon in concert in New Orleans. I’ve gravitated toward singer-songwriters because I like music I can relate to, which mostly encompasses personal songs written by one person. There’s something so direct yet complex about one person playing one instrument to convey one idea at a time. Simon opened with “America,” and I believe a person and his or her guitar is about as American as it gets. I started playing guitar last year to improve my dexterity and fell in love with the instrument. My learning curve felt more like a plateau, until all at once the rhythm of playing clicked in my mind on a typically mundane evening three months ago. Since then, I can’t put it down. So much of the structure and tone make sense to me in ways the piano didn’t. The last time I played keys was for school, and it felt like an elegant excuse to not go to PE. You may have heard me at Christmas. The bra section of Dillard’s never heard such a stirring rendition of “O Holy Night” by a sixth grader. A girl and her guitar. At the Simon show, I watched his musicians from around the world delve into his half-century repertoire. However, my eyes were mostly on his hands. I was close enough to see the oval outline of his fingernails as he went through songs from the 60s to now, each piece dipping its toe in the trends of the time while rooted firmly in his own sound. Simon’s friend, Cajun music legend Dickie Landry, was also in attendance. Simon introduced him to the crowd before performing “That Was Your Mother,” a song that directly references Lafayette and Clifton Chenier. For a small town to inspire Paul Simon, it must have something special in the way of music and songwriting. This Thursday at 8 p.m., Vermilionville has its own showcase of Louisiana guitarists. 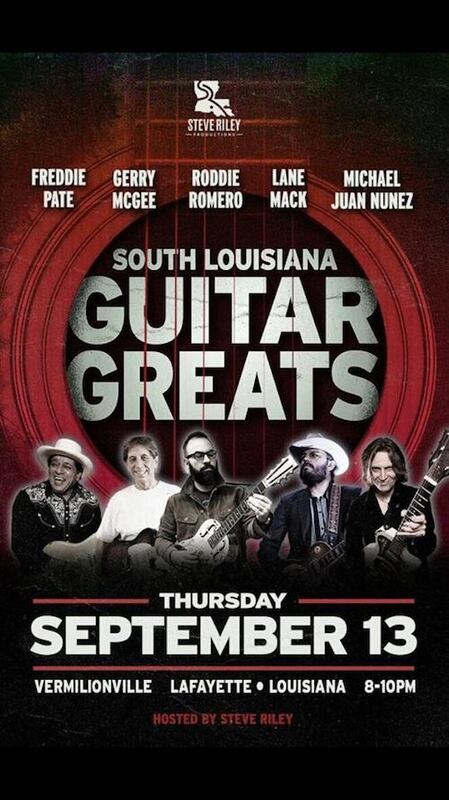 Steve Riley Productions has organized five Louisiana guitarists, Roddie Romero, Gerry Mcgee, Michael Juan Nunez, Freddie Pate and Lane Mack, to perform country, rock and blues for an intimate show. The five guitarists have played in numerous bands and melded genres throughout the years, but this show is especially for the guitar. What it can do, in the right hands, is astounding, and each artist has his own sound developed from years of dedication and education in multiple genres. Whether you’re an instrumentalist, or just a fan, it’s sure to be an inspiring set. Tickets to this unique showcase of Acadian talent are available by calling 337-789-1538. General admission tickets range between $25 and $35, and tickets for table seating range between $150 and $200.